Line cookie sheet with foil; spray with cooking spray. Stir baking mix, cheese, paprika and salt in shallow baking dish. Dip chicken strips into eggs, then coat with baking mixture; repeat dipping in eggs and baking mixture. Bake 18 to 20 minutes, turning after 8 minutes, until no longer pink in center. 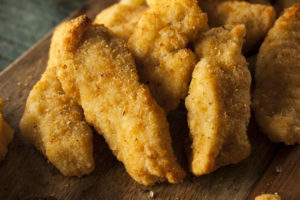 Enjoy the Gluten Free Chicken Tenders !